Here is my son's 21st birthday cake. 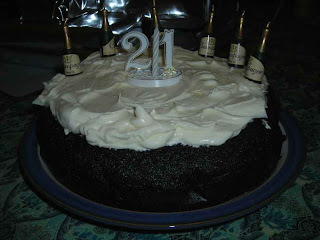 He requested Nigella's Guiness Chocolate Cake, which is a firm favourite with both of my sons. It is in her book 'Feast' and uses a whole pack of butter, a tub of sour cream and about 400g of sugar - yep, heart attack on a plate. The icing is cream cheese and double cream, oh boy is it good. I've heard so many things about this cake - and I think I really should get around to trying it! Haha, I was looking for sloth and came to the wrong blog, nothing slothful about this rich cake. Feast is a book I don't have - I must try and find the recipe online somewhere. I love her Pavlova and choc brownie recipes. In fact, haven't found a duff recipe yet. Off to find your sloth.